Will Johnson releases solo records when he isn’t releasing an album in one of the many bands he is in. Scorpion is his third proper solo album and comes nine years after his last. This record is not much different than Murder of Tides and Vultures Await that preceded it though. It seems his solo albums are all cut out of the same groove. It is interesting how Johnson can sonically tone down his sound so much from the blast of noise that is Centro matic down to a quiet acoustic album like this. Scorpion requires your attention. It will not have songs you’ll be singing in your head all day, it isn’t meant to be that kind of collection of songs. Instead what is here is a very personally sounding confessional from Johnson who puts his heart on his sleeve for the slow, gentle songs. 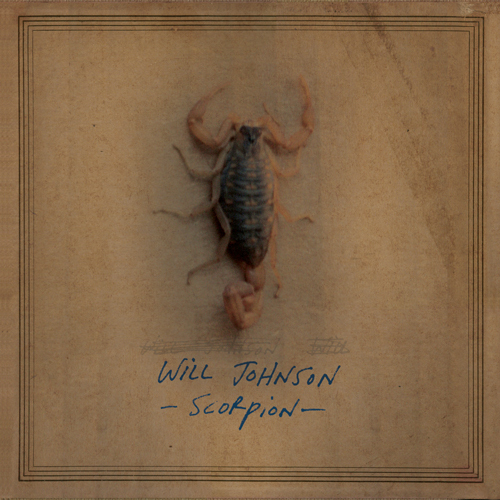 The song “Scorpion” is a standout along with “You Will Be Here, Mine.” Some of the most interesting moments of the record are Johnson’s acoustic guitar making the songs distinct and adding flair to the songs. The acoustic strums and picks on songs like “Riding From Within” and “Rosanky” are hypnotic at times and make you feel like you are in a dark room having Johnson in the room himself playing the tracks for you. The record fails to have a classic song like “Just To Know What You’ve Been Dreaming” but is still yet another solid release from Will Johnson. Would you like to hear this record? The first person to contact me and ask will get a free download of the entire album! Undertow very cooley included an extra download to help spread good music! I’m offering it to you. Email me at wiederholt8 at yahoo dot com. This entry was posted in 250 word album reviews and tagged 250 word album review, 3 stars, acoustic, Centro-Matic, quiet albums, Scorpion, Will Johnson. Bookmark the permalink.